Claire Blechman shows us the scene in North Station, where a Dunkin' Donuts is getting rebuilt this morning. As she notes, jittery commuters don't have to fret - they just have to walk another 100 feet or so to the station's other Dunkin' Donuts because, after all, this is Boston. Spotted in the State Street Dunkin' Donuts this morning. DNKN? Cross-promotional opportunity with DKNY? More examples. 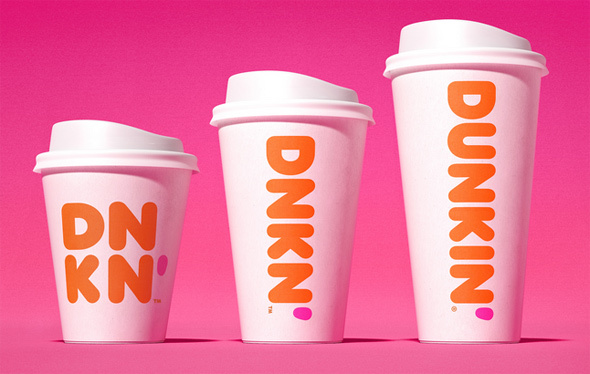 Dunkin' Donuts announced today it's changin' its name to just Dunkin' - because today's hard-chargin' consumers in this fast-paced world deserve a brand nimble enough to keep up with them, or somethin' like that, in the words of Dunkin' marketers tryin' to upscale a place that for decades has turned a profit selling simple coffee-like beverages and food-like substances to bleary-eyed people just tryin' to get to work: Read more. 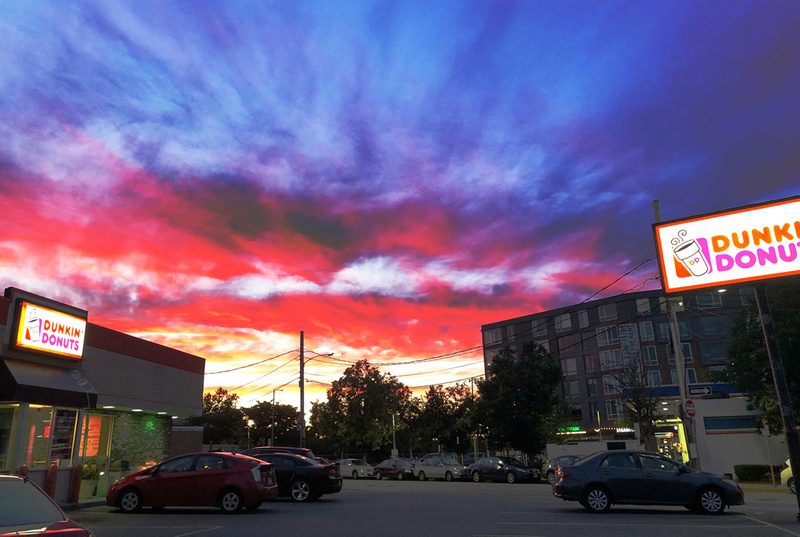 Ross Rotatori enjoyed the magnificent Dunk's - and the sunset behind it - at Barry's Corner in Lower Allston yesterday. Freed from the constraints of "donuts," the chain can now offer all sorts of things - like bags of ice. Robert Orthman spotted the sign offering ice this evening outside the still Dunkin' Donuts on Washington Street (the one near Roslindale Square, not the other one). 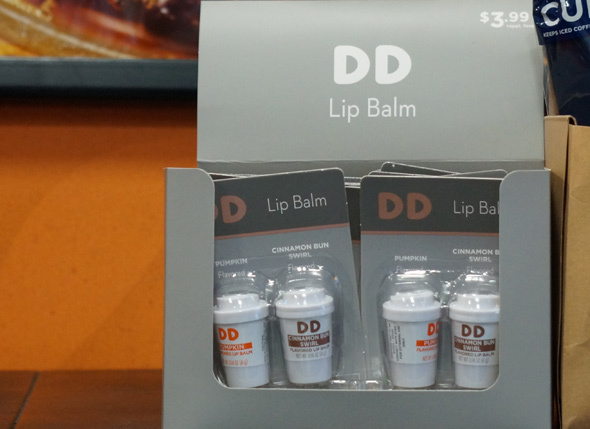 Workers have been busy on Washington Street near West Roxbury Parkway revamping the drive-up Dunkin' Donuts as a plain Dunkin', part of the chain's longstanding attempts to get us to try more of its non-coffee/non-donuts stuff. 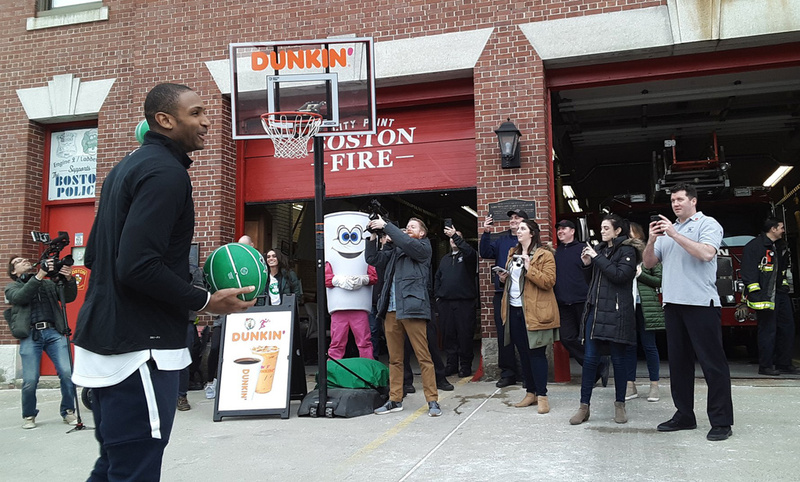 Duke Bennett visits the new Dunkin' (yes, just Dunkin') at 588 Washington St. in Quincy (where Wild Willy's Hamburgers used to be). 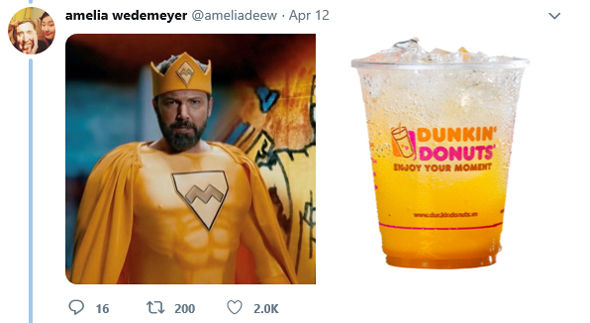 In what other state would Dunkin' Donuts coffee figure so prominently in a federal corruption indictment? The lengthy indictment against former state Sen. Brian Joyce features page after page about Dunkin' Donuts coffee - hundreds and hundreds of pounds of the stuff, in bags and boxes and K-cups - that the owner of more than 100 Dunkin' Donuts franchises allegedly gave Joyce in exchange for legislation aimed mainly at protecting the guy from suits over the pooling of employee tips. Read more. 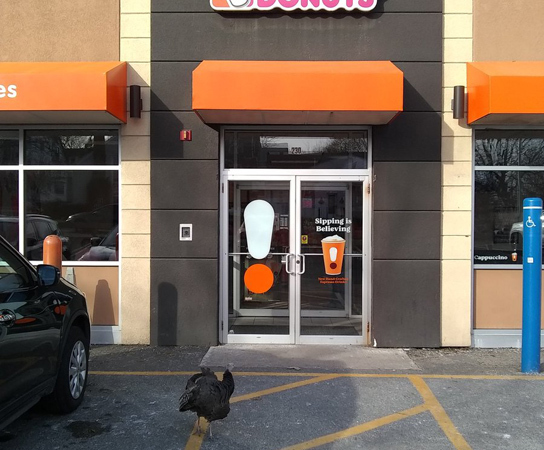 No, not a Dunkin' Donuts, just a Dunkin', the Quincy Patriot Ledger reports. A man who accused the woman behind him in line at the Cleveland Circle Dunkin' Donuts of stealing his wallet was arrested after the woman and witnesses said he went beyond accusing her and and started frisking her. Read more. But only on one side of the street which is unacceptable. The Dunkin' Donuts in the Little Building at Tremont and Boylston streets has ceased to be.